Helping Hands For Animals has accepted six new severe animal abuse cases requiring serious surgery and medical attention. The NGO lacks funds and is raising funds for atleast three of them and is in great need of help. Following are the details of all these cases. Zoro is just 1.5 months old. 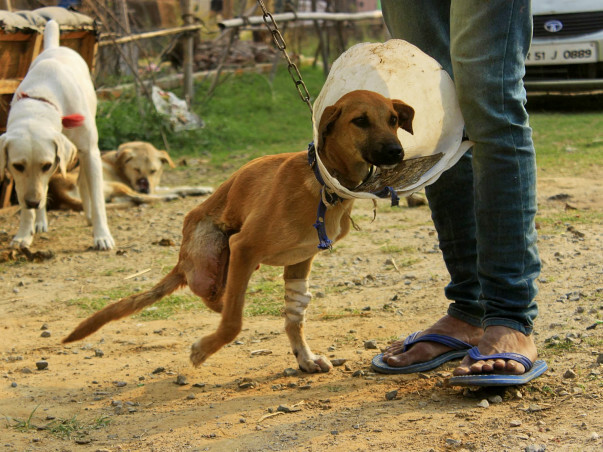 Zoro was rescued by a passerby from Kavinagar after someone ran over a wheel over his leg. Unfortunately, he was taken to a paravet for treatment who used a nail cutter to amputate his leg. His condition worsened and he was brought to the shelter. 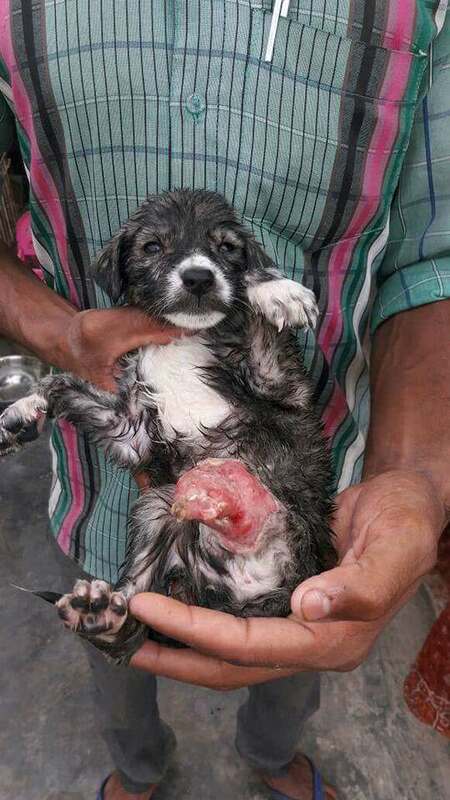 His leg was swelling up and burst open with pus one night leaving his skin completely dead. Hence, another surgery was performed. In his later X-Ray reports, we found another hind leg that was fractured and the front paw too was developing pus inside. After a surgery, it was removed. Half of his tail was found dead and it too, was removed. The pus is still forming in his amputated leg. To save Zoro's life, a proper surgery needs to be performed. His heavy medicines are costing the shelter. Woofer seemed like a dog injured from a dog fighting ring. He had gone through mental and physical trauma. As a result of this seemingly dreaded abuse, Woofer had lost the area near his eye. Unfortunately, the mass will never come over his eyes leaving him prone to diseases. He is now a permanent resident of the animal shelter and his expensive medication is causing the NGO to go down on funds. Miracle was miraculously rescued by our shelter workers. Miracle was tied with a rope around her neck since childhood but ran away from the custody long back. Upon growing up the rope around the neck remained intact but the body grew in size resulting into her body mutilating and the chest exposed with blood and lungs. 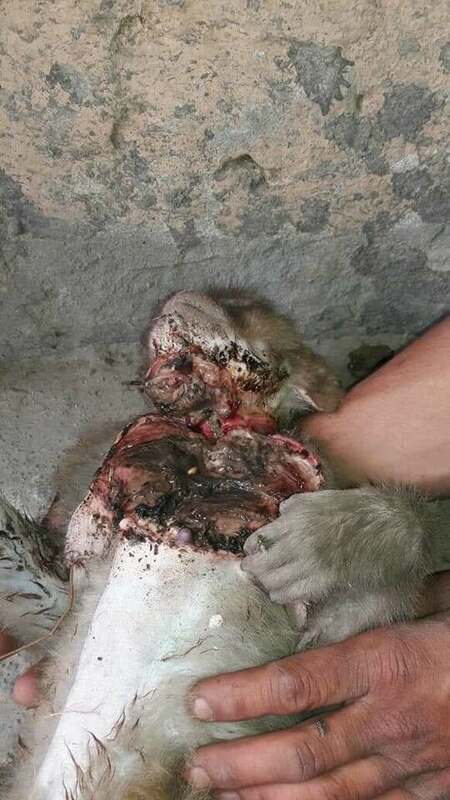 Miracle's organs were visible and her flesh was melting before she went for the surgery. Miracle's recovery will take time. Their total treatment cost of these three animals is coming out to be more than Rs.50,000 and the NGO is not able to meet the demands. We request your cooperation and help from all the humans with a heart of gold. Even your small contribution counts. We are blessed to have supporters like you. who are compassionate enough and have come forward for these voiceless. Our shelter kids are doing well and we request you to visit us and see our work (rescue, treatment and rehabilitate) for them and bless our kids with your love and care. We are still pending with a huge amount of bill of their treatment cost left behind. We also urge you to come forward and help us in clearing those bills asap. We are fortunate to inform you all that apart from that little pup, all the rest of bunch under treatment has been recovered completely and released back to their respective surroundings. But we are pending with a huge amount of bill of their treatment cost left behind. We urge you all to come forward and help us in clearing those bills asap. We are sorry to inform you all that the small kid with 2.5 legs couldn't survive. Rest all are going very well know. We hope to see you all soon at our unit for hanging around with our under-treatment kids. Thankyou all for your kind support. although we tried to raise 48000 towards the medical expenses of these six kids. and we have received only 12000 out of it. but we are happy to see change in our nation towards these voiceless souls. You guys are doing a great job, keep up the good work.